Pete’s Snow Dragon was found and captured (on camera!) by Pete Hillman in the UK. Here is the photo showing the Snow Dragon surging over and through the turbulent water. I see it as a Chinese-style dragon. Its very powerful, strong, and fast; its focus is on getting to the open sea as soon as possible. I would like it to stay near me as guardian and friend but this can never be because the beautiful Snow Dragon is wild and free. If you feel inspired by the Snow Dragon please see Pete’s Dragon, an invitation to participate in some Snow Dragon creativity! This is a mythical creature so you’ll need to use your imagination. Its surging at speed from left-to-right with its face and snout diving into the water at bottom-right corner. The dragon’s eye can be seen roughly two-thirds of the way along and not far above the bottom of the photo (two-thirds of the way along from the left). 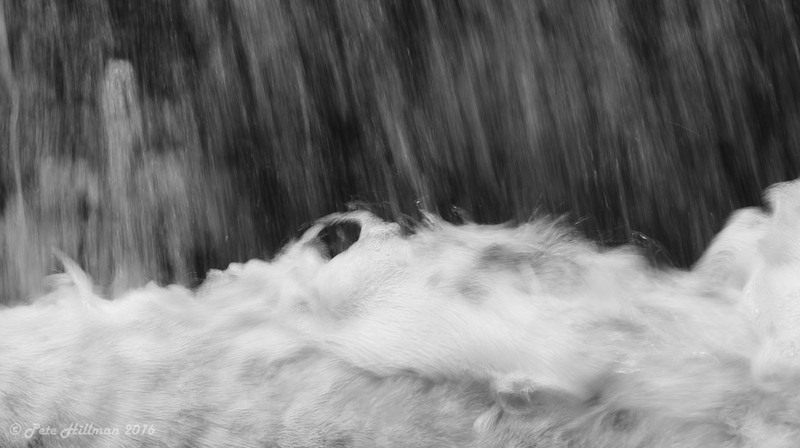 Most of the white-water is the dragon but its face and snout is entering into a piled-up wall of turbulent water at the far-right. The dragon is canted over side-wise a little bit as it surges over the wave (like a yacht heeling over on its side). The top half of the photo shows water spilling over a weir and serves as a waterfall background. Here is my best effort at drawing the dragon with its snout entering the wave but the real dragon above looks infinitely more handsome. This is just to help you identify it.